It’s a cruel, stealthy predator characterized by the unexpected loss of heart function, breathing, and consciousness, and it usually strikes without warning. It’s called sudden cardiac arrest (SCA). Two-thirds of SCA victims are unaware they have underlying heart conditions. Unfortunately, the condition is usually fatal, as only 6% to 7% of those who experience SCA survive, thus the majority succumb to sudden cardiac death (SCD). Responsible for about one-half of all cardiac deaths, an estimated 400,000 to 460,000 Americans die from SCA each year, according to the Sudden Cardiac Arrest Foundation. In SCA, the heart’s electrical system malfunctions and becomes irregular. The heart beats rapidly; sometimes ventricular fibrillation occurs and blood doesn’t travel through the body, especially to the brain, which results in loss of consciousness. The hope for survival rests on quick treatment to restore circulation within a few minutes, such as cardiopulmonary resuscitation, the use of a defibrillator to establish normal rhythm, advanced life support such as drug therapy, and therapeutic hypothermia. According to the Sudden Cardiac Arrest Foundation, emergency medical services treat about 60% of SCA cases. This continuing education activity will discuss the risk factors for SCD, healthful diet and lifestyle strategies that can help prevent coronary artery disease that often leads to SCD, and the role omega-3 fatty acids and antioxidants play in promoting and maintaining heart health. The Mayo Clinic reports that because SCA is so often linked with coronary artery disease, the same factors that put you at risk of coronary artery disease also may put you at risk of SCA. These include family history of coronary artery disease, smoking, hypertension, high blood cholesterol, obesity, diabetes, sedentary lifestyle, drinking too much alcohol (more than one to two drinks per day), age (after 45 for men and 55 for women), and being male, as men have two to three times the risk of SCA than women. • Scarring or enlargement of the heart from a previous heart attack or other causes can make someone more prone to developing life-threatening ventricular arrhythmias. The first six months after a heart attack is a particularly high-risk period for SCA in patients with atherosclerotic heart disease. • Cardiomyopathy, a thickened heart muscle from any cause—though high blood pressure or valvular heart disease typically is the root—can cause SCA. • Heart medications, under certain conditions, can set the stage for arrhythmias that cause SCA. Antiarrhythmic drugs sometimes can produce lethal ventricular arrhythmias, even at normal doses. Regardless of whether heart disease is present, significant changes in blood levels of potassium and magnesium (from using diuretics, for example) also can cause life-threatening arrhythmias and SCA. • Electrical abnormalities, such as Wolff-Parkinson-White syndrome (a condition with an extra electrical pathway in the heart) and long QT syndrome (a disorder of the heart’s electrical activity) may cause SCA in children and young people. It’s important to note that SCD in young athletes is rare. • Blood vessel abnormalities, particularly in the coronary arteries and aorta, may be present in young SCD victims. Adrenaline released during intense physical or athletic activity often acts as a trigger for SCA when these abnormalities are present. • Recreational drug use, even in people without organic heart disease, is a cause of SCA. A growing body of research supports the role of lifestyle measures in protecting against this sudden, silent killer, and dietitians can make a significant impact by helping reduce SCD risk among their patients, potentially saving thousands of lives. In fact, given the serious outcome of this disease, scientists are looking to diet as one of the most promising primary prevention strategies. The most important line of defense is adopting heart-healthy lifestyles that can guard against heart disease in the first place. “All Americans should be living a heart-healthy lifestyle to prevent coronary artery disease—our nation’s leading cause of death,” Brill stresses. The urgency of preventive approaches takes on even more meaning when you consider that most victims of SCD weren’t identified as being at risk, yet research indicates that lifestyle certainly can help prevent these deaths. The results of a study published in a 2011 issue of The Journal of the American Medical Association concluded that 81% of cases of SCD were due to unhealthful lifestyles. The study, funded by the National Institutes of Health and the AHA, found that a Mediterranean-style diet, when combined with other healthful behaviors, such as maintaining a healthful weight, not smoking, and exercising, provided a 92% reduced risk of SCD. • Saturated fat: less than 7% of total energy intake. In particular, Brill stresses omega-3 fatty acid recommendations for heart health, particularly fatty fish such as salmon, mackerel, herring, lake trout, sardines, and albacore tuna, which contain high amounts of omega-3s. “All Americans should strive to get in enough omega-3 fat from both marine and plant sources. I suggest aiming for 3 g of plant ALA [alpha-linolenic acid] per day, the amount in 2 T of ground flaxseeds and 1 g of EPA and DHA per day, the amount in a small piece of salmon,” Brill says. Once someone develops risk factors for SCA, it’s even more essential to enact extra lifestyle measures to prevent cardiac arrest or death. “Heart disease survivors should take extra precautions against arrhythmias, since they’re at a much higher risk for SCD. In terms of assessments, the dietitian should first determine the general risk for coronary artery disease and treat accordingly. If the patient has been previously diagnosed with coronary artery disease, the dietitian should be aware that these patients are at higher risk for SCD and should therefore be more aggressive in their treatment recommendations,” notes Brill, who says that, according to the AHA, one in three women and one in four men will die within one year of having their first heart attack, either from another attack or SCA. “Obviously, changes must be made to prevent that second cardiac event,” she says. 1. Follow a Mediterranean-style diet and include a daily source of plant omega-3 ALA (at least 3 g/day). 2. Eat fish and take fish oil capsules—at least two fatty-fish meals per week plus fish oil supplements (2 to 4 g/day, depending on triglyceride levels). The AHA reports that fish oil can have a profound triglyceride-lowering effect, with 4 g/day of omega-3 fatty acids from fish oil decreasing serum triglyceride concentrations by 25% to 30%. Higher doses of 3 to 5 g/day may be effective for marked hypertriglyceridemia (greater than 750 mg/dL) under a physician’s care. 3. Take statin medication under physician supervision. For additional information and patient resources on the Mediterranean diet, such as the Mediterranean Diet Pyramid, diet and cooking tips, and recipes, visit www.oldwayspt.org. 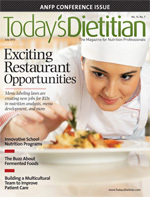 You also can refer to “The Mediterranean Diet” feature in the May 2012 issue of Today’s Dietitian. Increasing omega-3 fatty acids is a key strategy for protecting against SCD based on research that includes controlled trials, large-scale observational studies, and experimental studies.4 “Eating fish oil will stabilize a vulnerable heart muscle by decreasing risk of arrhythmias, thereby preventing SCD. Why fish oils have this powerful antiarrhythmic effect is still a bit of a mystery, but research clearly proves that fish oil works,” says Brill, noting that proposed mechanisms that explain these protective observations for omega-3 fatty acids include a stabilizing effect on the myocardium itself, a reduction in resting heart rate, an increase in left ventricular filling capacity, and potent antiarrhythmic effects. “The AHA suggests that, ideally, heart patients should obtain their omega-3s from the consumption of oily fish—1 g of EPA/DHA can be obtained from eating about 3.5 oz of oily fish such as salmon, Atlantic mackerel, or sardines—as opposed to popping the pills. The AHA states that the use of fish oil capsules also is acceptable but should be considered only in consultation with the patient’s physician,” Brill says. Brill says prescription fish oil may be your patients’ best bet for protection. She recommends Lovaza, formerly known as Omacor, as a prescription fish oil supplement that’s guaranteed by the FDA to be a safe, high-quality fish oil, free of contaminants and impurities, that contains exactly what’s on the label. Prescription fish oil differs from over-the-counter supplements, which can vary in quality, purity, and dosage. One Lovaza capsule provides approximately 900 mg of mixed EPA and DHA omega-3 fatty acids. “Dietitians should know that the FDA has limited approval of Lovaza for the treatment of adult patients diagnosed with very high triglyceride levels [500 mg/dL or greater]. Therefore, patients need to discuss with their personal physician if this prescription is right for them,” Brill adds. Fish oil also may work in unison with medications such as statins. “Research has shown that people with coronary artery disease who take the two-drug combo of fish oil and statin medication have a 19% reduction of risk of having another major coronary event, such as another fatal or nonfatal heart attack, sudden cardiac death, uncontrolled angina, or bypass surgery, compared with the people who take statins only,” Brill says. One can infer that antioxidants may have a role in preventing SCD. This is one of the many benefits seen in the Mediterranean diet, which is rich in antioxidants. Indeed, heart conditions are now known to have a root in oxidative stress and inflammation. Some studies have found mixed results with antioxidants, such as selenium, vitamin E, and individual foods, including grape seed proanthocyanidins, but there’s a lack of research in this area. New attention is focusing on the role minerals may play in protecting against SCD. Magnesium has antiarrhythmic properties in animal and cell studies.8 In the Nurses’ Health Study, Chiuve and her team found that higher plasma and dietary magnesium levels were associated with lower rates of SCD.8 Potassium also has protective effects against SCD, according to a 2010 review by a Danish scientist. Potassium deficiency—hypokalemia—is linked with an increased risk of arrhythmia in patients with cardiovascular disease as well as greater all-cause mortality, cardiovascular mortality, and heart failure mortality up to 10-fold, according to the review. Non–potassium-sparing diuretics often precipitate these outcomes.9 So it appears that maintaining adequate levels of these essential minerals is a key strategy in reducing SCD risk. In addition to diet, it’s important for clients to maintain appropriate healthcare management and follow-up with healthcare practitioners to monitor heart function, medication usage, and the management of diabetes, high blood pressure, and elevated blood lipid levels. As a dietitian, you’re poised to help patients fight off this silent killer. Fortunately, these are the same lifestyle recommendations that can help your clients find their way to overall better health. Eat a variety of (preferably oily) fish at least twice per week. Include oils and foods rich in alpha-linolenic acid (eg, flaxseed, canola, and soybean oils; flaxseeds; and walnuts). Consume roughly 1 g of EPA and DHA per day, preferably from oily fish. EPA and DHA supplements could be considered under the supervision of a physician. Take 2 to 4 g of EPA and DHA per day provided as capsules under a physician’s care. 1. Assess the risk factors of sudden cardiac death. 2. Counsel patients on the primary prevention lifestyle strategies for coronary artery disease. 3. Educate patients on the secondary prevention lifestyle strategies that can help prevent sudden cardiac arrest and ultimately sudden cardiac death. 4. Evaluate the role antioxidants play in reducing the risk of sudden cardiac death. 1. Sudden cardiac death (SCD) is another term for a sudden, massive heart attack. 2. Which of the following statements about SCD is true? a. Most people have identified risk factors that make them aware of their risk. b. The majority of people suffering from sudden cardiac arrest survive. c. Sudden cardiac arrest is responsible for about one-half of all cardiac deaths. d. SCD takes the lives of about 100,000 people per year. 4. Which of the following risk factors place people at a higher risk of SCD? 6. All people should consume which of the following daily amounts of omega-3 fatty acids to improve heart health? 7. If a patient was previously diagnosed with coronary artery disease, the dietitian should take a three-pronged approach by recommending that the patient follow the Mediterranean diet, speak to a primary care physician about taking statin medication, and eat two fatty fish meals per week plus take how many grams of fish oil supplements per day, depending on triglyceride levels? 8. According to research, some of the health benefits of fish oil consumption in the prevention of SCD include which of the following? a. Fish oil stabilizes vulnerable heart muscle by decreasing arrhythmias. b. Fish oil reduces resting heart rate. c. Fish oil increases left ventricular filling capacity. 9. Antioxidants have been proven to lower the risk of SCD in humans. 10. Which of the following minerals have been linked to lower rates of SCD? 1. Chiuve SE, Fun TT, Rexrode KM, et al. Adherence to a low-risk, healthy lifestyle and risk of sudden cardiac death among women. JAMA. 2011;306(1):62-69. 2. Mitka M. Author insights: healthy lifestyle may reduce risk of sudden cardiac death in women. News@JAMA website. http://newsatjama.jama.com/2011/07/05/author-insights-healthy-lifestyle-may-reduce-risk-of-sudden-cardiac-death-in-women. July 5, 2011. Accessed April 14, 2012. 3. De Lorgeril M, Salen P, Defaye P, Mabo P, Paillard F. Dietary prevention of sudden cardiac death. Euro Heart J. 2002;23(4):277-285. 4. Leaf A. Diet and sudden cardiac death. J Nutr Health Aging. 2001;5(3):173-178. 5. Lee JH, O’Keefe JH, Lavie CJ, Marchioli R, Harris WS. Omega-3 fatty acids for cardioprotection. Mayo Clin Proc. 2008;83(3):324-332. 6. Albert CM, Oh K, Whang W, et al. Dietary alpha-linolenic acid intake and risk of sudden cardiac death and coronary heart disease. Circulation. 2005;112(21):3232-3238. 7. Rasoli S, Kakouros N, Harling L, et al. Antioxidant vitamins in the prevention of atrial fibrillation: what is the evidence? Cardiol Res Pract. 2011;2011:164078. 8. Chiuve SE, Korngold EC, Januzzi JL, Gantzer ML, Albert CM. Plasma and dietary magnesium and risk of sudden cardiac death in women. Am J Clin Nutr. 2011;93(2):253-260. 9. Kjeldsen K. Hypokalemia and sudden cardiac death. Exp Clin Cardiol. 2010;15(4):e96–e99.